Contributor Alison Grifa Ismaili’s story, “The Stop,” is set in Morocco. 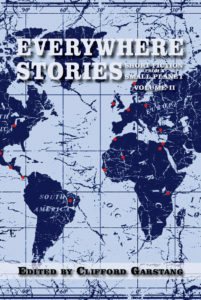 It’s one of 20 stories included in Volume II of Everywhere Stories: Short Fiction from a Small Planet, available now from Press 53, Amazon, and Barnes & Noble. 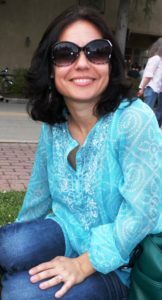 Alison Grifa Ismaili’s work has been published in Fiction International, Litro (UK), and Bartleby Snopes, among others. Currently, she resides in Baton Rouge, Louisiana, with her two little boys and her very patient husband. Alison’s comment on “The Stop”— I drew inspiration to write “The Stop” back in 2010 while I was making a series of bus trips to visit my in-laws in the Sahara. I had been traveling on the route from El Jadida to Marrakech when our bus stopped in Booshen, and there was a group of vendors selling all sorts of wares. Among them, a little boy weaved in and out of the crowds with a basket of prickly pears. Something struck me about his little face, and for some reason, I’ve carried him around with me for the past few years. I’m not great at journaling, but at the time, I had the good sense to scribble down, “Booshen. Prickly pears.” I’ve always wanted to go back to his image and write something to convey his calm and comfort in the frenetic marketplace. This past winter, late 2015, I was finally able to piece together the rest of the story.